The giant porbeagle - which was more than eight foot in length and weighed nearly 40 stone - was caught off the Cornish coast. Marcus Wixey wants to change the EU rules which means he can only keep 1% of sea bass caught by trawler net. Eco designer Linda Thomas used nets and thousands of metres of fishing line to craft the gown. Adam Mitchell realised the pike he landed had made a catch of its own. 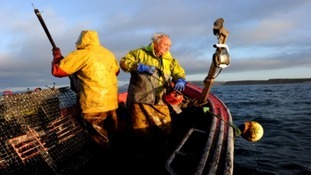 ITV West Country speak to two lobster fishermen in West Bay and a local photographer who's publishing a book about them. A group of fishermen in Cornwall have taken the British catch and release record after reeling in a massive blue shark. John Dines from Essex caught the animal ten miles off the coast of Penzance. Mr Dines was helped to bring the shark in by 3 of his friends. A weight of 256 pounds makes it the largest blue shark ever caught in British waters. The previous record of 214 pounds has stood since 1959. After the shark's weight was calculated it was released back into the sea. Robin Chapman, who was skipper of the boat when Mr Dines caught the shark, took a photo as proof. He says catch and release is "the way forward in protecting our fishery for many generations to come." Well done John Dines - cracking achievement mate. Also thanks to the Shark Club for finally moving things in the right direction. Fishermen in Cornwall say warmer waters are bringing with them species rarely seen around our coastline. Hundreds of thousands of dead sardines have covered the sands of Marazion beach in West Cornwall. A giant tuna weighing over 300lbs has been caught off the Cornish coast. The Giant Atlantic Bluefin tuna, which is worth thousands of pounds on the black market, was hauled in five miles off the shore. Dan Gardner, who skippers the boat, said the creature put up quite a fight. This one got on the boat but we wont be doing that again. It took fisherman Alan Wright three hours to haul in the massive fish. They put a rope around its tail and balanced the fish under its chin to calm it down. They then bundled it aboard where they measured it – and it was 78 inches from tail to jaw. Bluefin are one of the largest species of tuna and can live up to 40 years. In 2013 a Bluefin Tuna sold for a record £1.09 million at a Tokyo auction. They are one of the most valuable fish in the sea. They are worth tens of thousands of pounds. But it is illegal and they are only worth that on the black market. The huge fish is an endangered species and highly protected - after taking a photo this giant was gently released back into the sea.